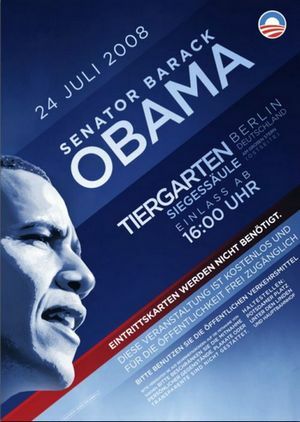 Obama is no longer toast, Obama is giving a talk at the Siegessäule in Berlin tomorrow. Cheering is guaranteed, his talk will be a huge event, and people have high expectations. Spiegel International reports Obama’s campaign is frustrated over vehement discussions in German politics about his speech in Berlin scheduled for Thursday, but this criticism can be explained with the fact that we will have our national elections 2009, and there is increasng tension between Christian democrats (CDU) and Social Democrats (SPD) as election year approaches. Markus Beckedahl at Netzpolitik has done an interview Daniel Weitzner, a member of the advisory team “Technology Media and Telecommunications policy committee advising the Obama ‘08 Campaign” to Obama concerned with internet related topics and co-author of a whitepaper on internet technology. Here is the full interview: NetzpolitikTV 042: Die Netzpolitik von Barack Obama [Text by Markus Beckedahl in German, watch Interview in English]. Since the age of Sesame Street I strongly appreciate the importance of educational TV. Via Netzpolitik & Hauptstadtblog.